Mild weather in February and March – and especially the ‘heatwave’ in late February – saw many visitors in the garden enjoying the early spring flowers. However, the unseasonal temperatures brought an early close to the aconites, snowdrops and crocuses. Daffodils are showing well now and will hopefully last into April. At the time of writing, early-flowering trees are in full blossom, with some fabulous displays of pink and white flowering cherry and yellow Cornus mas. Hellebores are also at their best now. Even some of the ground-cover plants, such as early-flowering borage, comfrey and Pulmonaria are in bloom, providing a good early source of food for emergent bumblebees and butterflies. Visitors frequently comment on how well the garden is maintained. We are very grateful to the commitment of the garden volunteers for all the work they do, which has been quite demanding in recent months. Even in the winter season, there are lots of jobs to do. If you have spare time on Tuesday, Thursday or Saturday mornings, you would be most welcome to join our friendly team and help out in the garden, whatever your interest or level of experience. Do drop in for a chat and find out where you could fit in. A few sycamores were removed in January and some of the walnut trees trimmed back to remove excessive shading in parts of the garden. Visitors will have noticed the piles of sycamore logs and branches, which the volunteers are now dealing with. During the colder weather in January, our log store was almost depleted, but we were able to replenish this with seasoned wood from Sawston Hall, for which we are very grateful. We are now building up stores of logs for next winter. There are two important events coming up soon. Firstly, our regular children’s Easter Saturday morning event on 20th April from 10am to 12 noon. All the usual activities, including treasure hunt, nature trail, craft work, seasonal painting and face painting. And, for the first time, a marbled Easter egg competition – look out for posters and fliers with details on how to enter. Refreshments, as ever, with Andy’s (seasonal) soup kitchen and tea and cakes from MCTeas. 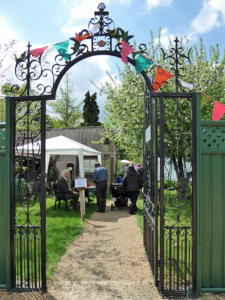 Our anniversary fete this year will celebrate ten years since the garden was formally opened on 17th May 2009. We plan to make this a special occasion with more attractions than usual. 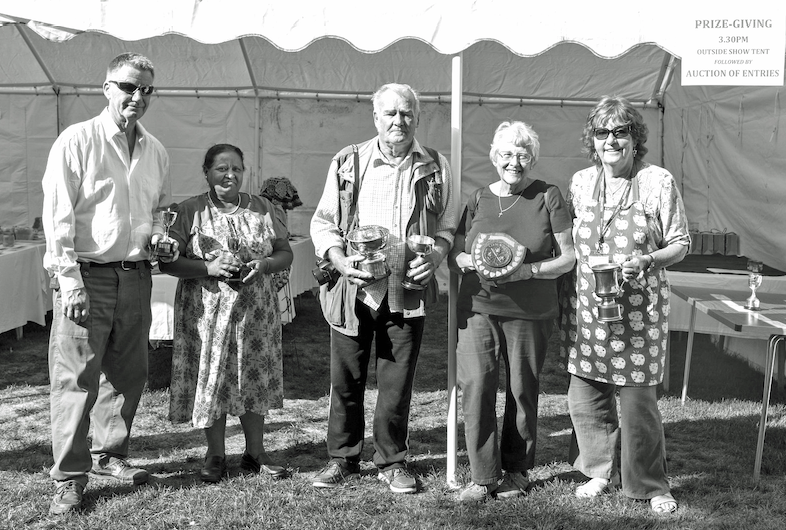 In addition to the regular attractions and Sawston Steel Pan Band, the Cambridge Flower Club will be putting on flower-arranging demonstrations. Do come along and join in the celebrations. The fete is on Sunday 19th May from 2pm (not 20th May, as advertised in the February–March issue – our apologies for the confusion). Some good news for the pomologists out there! We have been investigating the origin of the old apple tree just inside the main entrance to the garden. It is estimated to be fifty to sixty years old, but there are no records of when it was planted or which variety it is. Some locals thought it to be a Doctor Harvey apple, an old culinary variety no longer planted commercially, and it certainly looks similar to the Dr Harvey in the collection at Audley End. However, DNA fingerprinting last year failed to find a match in the national database, so we were none the wiser. One experienced observer who examined the fruit last year considered it to have characteristics of Cox’s Orange Pippin (COP). The possibility of the tree being derived from a cross between COP and Dr Harvey was investigated on the DNA database and – bingo! – this does appear to be the case. We are now very confident that our tree is a cross of COP x Dr Harvey and there is no other such match in the national database. 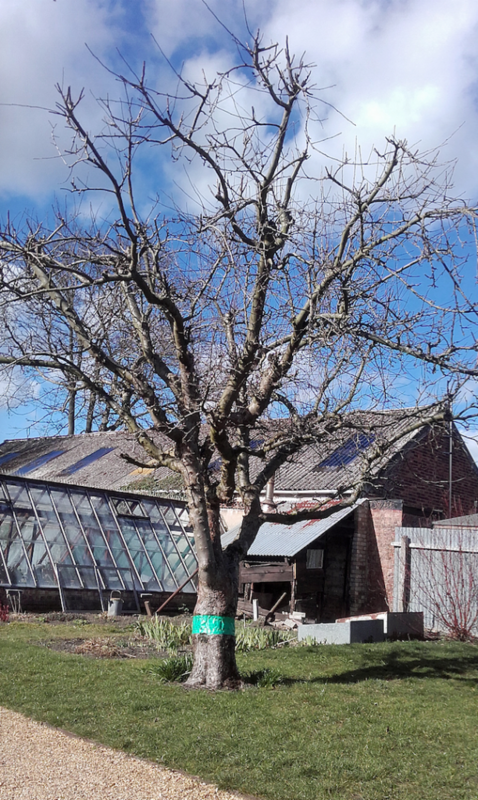 We are delighted to announce that the tree has been accepted as a unique variety in the national Register of Local Cultivars and has been accorded the name of Mary Challis. With this wonderful news, we have put a conservation plan in place to conserve the variety and have made a start on producing new trees by grafting. 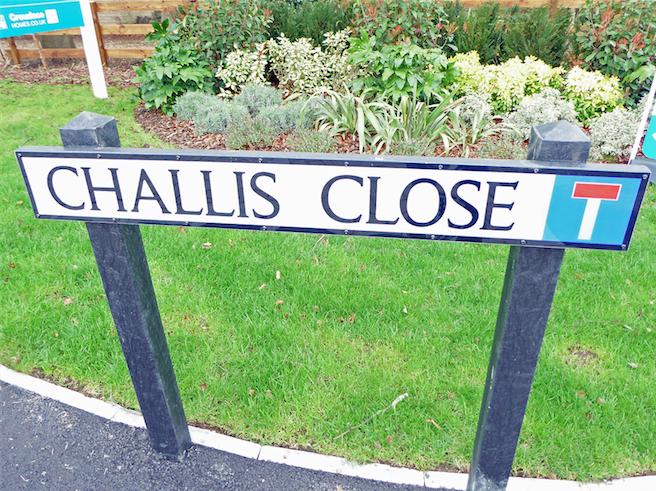 Sharp-eyed citizens may have noticed that the new road into the Croudace housing development along Mill Lane has been named ‘Challis Close’. It is very pleasing to have the Challis family name recognised in this way in the village. The name was one of a number proposed by the Village History Society, when they were approached by the Parish Council, and then chosen as the official new road name by South Cambridgeshire District Council. It’s always good to reflect on the year past at the start of a new year. Last year proved to be a busy one. 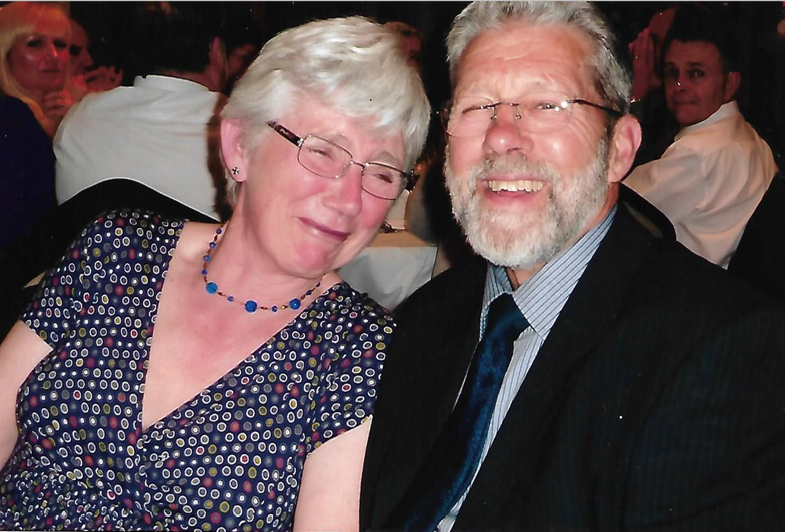 We held ten public events during the course of the year and hosted twelve booked visits and private functions (from garden clubs, horticultural societies, Brownies and other village groups). The garden team are becoming increasingly adept and efficient at putting up and taking down the marquee, party tents and gazebos used on these occasions! 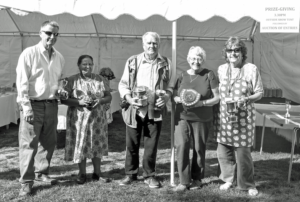 Our thanks to everyone who supported these events, and of course to the many volunteers that help in the garden, stewarding at events or serving refreshments. We could still use more help to ensure we can continue to hold regular events and maintain the garden to a good standard. If you are interested, please contact us or drop into the garden on one of our regular open mornings to see what we do. The schedule of events for 2019 is shown on the inside cover of this issue. Do please make a note of these in your diaries. All events will be advertised in the Sawston Scene Diary. This year is the tenth anniversary of the formal opening of the garden, so we plan to have a special Anniversary Fete this year. Look out for details in due course. Further good progress was made last year to our infrastructure and buildings. In the garden, internal footpaths were resurfaced, bore-hole equipment replaced and the ‘pink shed’ demolished. Repairs to the car park were carried out and essential maintenance undertaken on our neighbouring property, greatly improving the integrity and appearance of the passageway to the car park. 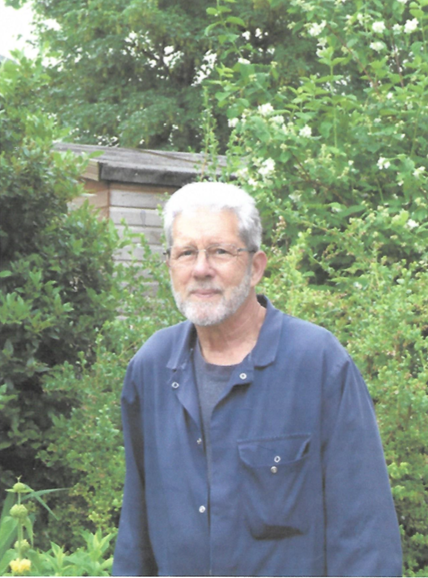 Many thanks, as ever, to our builders Ray and Graham for their support and skilled workmanship. The final phase of interior work was completed in the Challis house, allowing us to transfer the village archives from the Parish Council office and to formally open the Challis Museum and Archives. This is an important milestone for the trust and a great asset for the local community. If you haven’t been already, do drop in on a Tuesday morning to have a look at the permanent exhibition rooms and perhaps to browse the library and archives. Anyone wishing to do more serious research on Sawston village history can arrange to visit the archives on a Saturday morning by appointment. The major project for 2019 is to construct a replacement building where the ‘pink shed’ stood. This is primarily to accommodate a garden museum where we can display old gardening equipment and associated artefacts. Gardening work is on schedule. The herbaceous beds and individual shrubs have been weeded, cut back, pruned and mulched to give them a good start for the forthcoming season. We are currently focused on reducing heavy growth of ivy in parts of the garden and removing unwanted Prunus suckers. Hard work, but certainly keeps us warm on cold mornings! A few more sycamores will be removed this winter, to reduce excessive shade, allowing ground flora and under-storey shrubs to flourish. A start will also be made on remedial work to shorten overhanging walnut branches in one area. There has been plenty to enjoy in the garden in recent weeks, with good autumn colours developing on trees and shrubs, and some perennials and bedding plants persisting well into November. However, the first frosts in late October put paid to the most sensitive plants, notably dahlias, nasturtiums and begonias. The garden team are busy now tidying up the herbaceous beds in preparation for next year – lots of weeding, pruning, dividing and mulching to be done. Leaves are now dropping regularly; most of these are picked up by our sit-on mower and collected in two large wire ‘cages’ to produce leaf mould for next year. We have just had our annual bonfire, close to Guy Fawkes Night, to burn non-compostable material collected over the course of the year. We could still use some more help in the garden. If you have spare time on Tuesday, Thursday or Saturday mornings, you are very welcome to join our garden team and help with a range of tasks. Our vegetable beds and fruit trees performed well, considering the rather extreme weather this year. 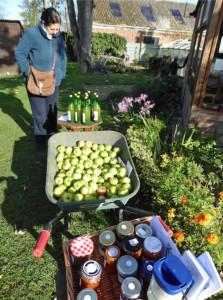 The last of the apples and summer vegetables have been picked and sold or processed into jams, chutneys and relishes. Our thanks to Andy Jackson for keeping us supplied with a range of preserves throughout the year. His courgette relish is always in demand! Our bees have not been so active this year, with just one hive coming through the harsh winter and spring weather. Although they appeared active through the hot, dry period, there was clearly not much nectar available, and so did not build up adequate honey stores during the main season. However, they were very active in September and October, bringing in lots of ivy nectar and pollen, so there may be a small surplus of honey to extract. The garden hosted two very successful events in October. The Apple Day was well attended, blessed with some good autumn sunshine. Large quantities of apples were processed into juice, with has proved very popular with visitors. There are still a few bottles left if you haven’t tried some yet! Thanks to everyone who brought their apples along and to the volunteers for helping out on the day. The event was perhaps a little late in the season for the main crop of dessert apples. It is planned to hold it earlier next year, which should produce a greater mix of varieties for juicing. The generous grants from SCDC’s Community Chest and Cambridge University Rag Appeal to purchase the equipment are gratefully acknowledged. Our popular Spooky Saturday was again very well attended, with plenty of activities to entertain lots of children on a rather cold morning. Some very impressive pumpkin-carving and face-painting was on show! Thanks again to all the visitors and volunteers for making this event so successful. The Christmas wreath-making workshop will be held on Saturday 1st December in the Long Barn in the garden. Tuition will be given and all materials provided, plus mulled wine and mince pies. What’s not to like! Book a place to make your own wreaths. Details are in the Diary and on posters in the High Street. Our museum volunteers are making good progress sorting and archiving the large volume of material in the house. Additional material is still coming in, with a batch from the Parish Church archives, mostly accounts and invoices. The two storage rooms on the second floor are almost full and attention is now being given to sorting out their contents. A number of photographs, paintings and posters in the collection have been re-framed. Some of these will be hung in the permanent exhibition rooms to refresh the wall displays. Building work along the passage to the car park continues, effecting necessary repairs to the exterior walls, windows and rainwater goods in the adjoining property. Scaffolding will remain in place until work is completed, but this does not impede access for visitors to the garden or museum. Parking is available to the rear of Tucker Gardner for the time being.